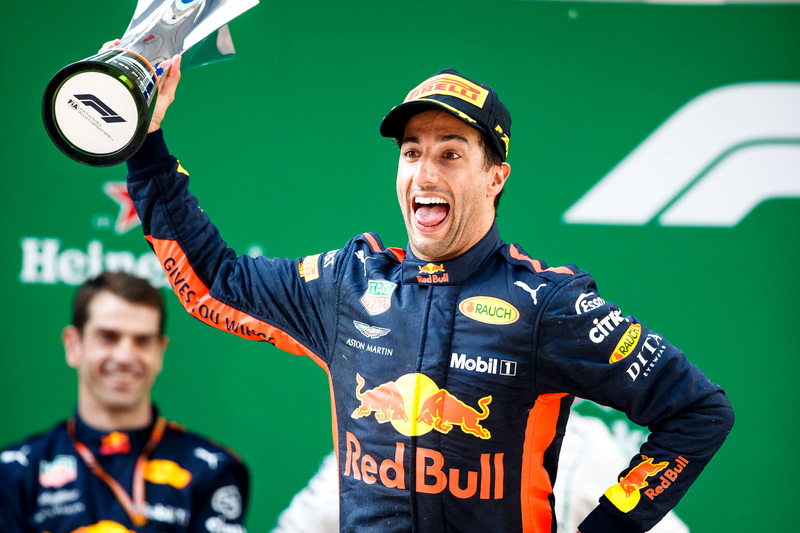 Daniel Ricciardo has scored a stunning victory at the Chinese Grand Prix with a sublime eight-lap overtaking spree against the more fancied Mercedes and Ferrari frontrunners. The battle for the lead had reached a stalemate by lap 35 after Valtteri Bottas had jumped Sebastian Vettel in the pit stop window, but a clumsy collision between Toro Rosso teammates Pierre Gasly and Brendon Hartley created enough debris to trigger a safety car, at which point Red Bull Racing pounced into an emergency pit stop. The team switched both Max Verstappen and Ricciardo off the slower medium tyres and onto the grippier soft compound, giving them an immediate pace advantage over Mercedes and Ferrari, which elected to leave their cars out. Ricciardo first sliced past Ferrari’s Kimi Raikkonen for fifth place on lap 37, joining teammate Verstappen in fourth, who was pressuring Lewis Hamilton for third. The Dutchman, enlivened by his newfound pace, attempted to pass the Briton around the outside of turn seven on lap 38, but it was too ambitious, and the Red Bull Racing car slid off the track. He lost only one position to his teammate, who slide past Hamilton for third place on lap 39 and began bearing down on Vettel in second. It took him only two laps to outfox the German in a daring parry at the end of the long back straight. Verstappen, meanwhile, had recovered to pass Hamilton and by lap 43 and was also sizing up Vettel, but the 20-year-old botched his opportunity at the hairpin, running into the side of Vettel and dropping himself back to fifth and the Ferrari down to seventh behind Renault’s Nico Hulkenberg. The stewards handed Verstappen a 10-second time penalty for the error. Ricciardo needed to make only one more pass to seal the race win, and it was perhaps the most aggressive of the race. Speeding down to turn six with Bottas squirming defensively in the braking zone, Ricciardo scythed into a shrinking gap on the inside, just avoiding contact and emerging with the lead on the other side of the apex. The Red Bull Racing driver sped off into the distance, setting the fastest lap of the race for good measure, to record his sixth career victory. Ricciardo paid tribute to his mechanics, who worked for three hours before qualifying to replace his engine, which had failed in free practice three. It was touch and go whether he would be able to qualify, but the team sent him out with three minutes remaining on the clock, just enough time to set one lap. Valtteri Bottas finished a disappointed second, lamenting the bad timing of the safety car that left him defenceless against Ricciardo’s charging bull. “The race was going pretty well for us and we were looking strong all the way until the guys [Red Bull Racing] during the safety car stopped,” he said. “We were in trouble with Daniel and even with Kimi [Raikkonen] in the end. Kimi Raikkonen finished un unexpectedly profitable third despite his Ferrari team hanging him out to dry early in the race to benefit his teammate’s race strategy. After Vettel was undercut by Bottas, Ferrari left the Finn out on worn tyres in the lead to create a roadblock to slow the Mercedes down and provide Vettel with a chance to close the gap. It worked, but not effectively enough for Vettel to jump Bottas, and only after both had passed Raikkonen did Ferrari stop him for new tyres. “I think we made a good start,” he said. “Then obviously we stayed very long out. Max Verstappen recovered to pass Lewis Hamilton for fourth on lap 48, but his penalty dropped him back down to fifth ahead of Renault’s Nico Hulkenberg in sixth. Vettel briefly challenged Hulkenberg after his crash with Verstappen dropped him to seventh, but the Renault had also pitted for new tyres behind the safety car, leaving the Ferrari driver with a pace disadvantage he wasn’t able to overcome. Worse still for Vettel was that McLaren’s Fernando Alonso was building momentum in the final stint, and on the penultimate lap the Spaniard passed him for seventh. The German finished eighth, half a second ahead of Renault’s Carlos Sainz and 3.5 seconds ahead of Haas’s Kevin Magnussen in the final points-paying places. Formula One continues with the 2018 Azerbaijan Grand Prix on 29 April.